Steak soaked in a Caribbean-inspired marinade with SO much flavor, then grilled and served up in tacos with Pineapple Salsa, Guacamole, and finally, Caribbean Queso Fundido. 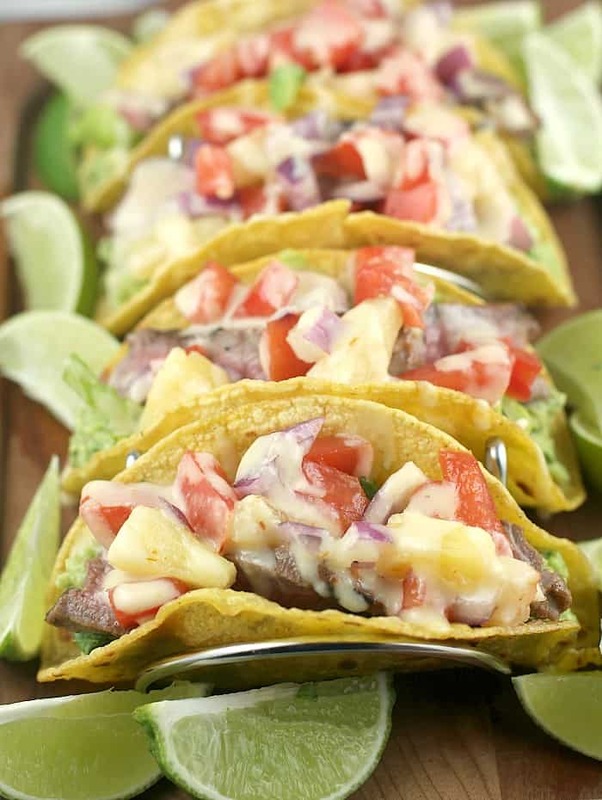 These Epic Steak Tacos Caribe are a must-try, must-do, bucket list, EPIC good recipe. Heyyy it’s FALL! You know what that means here in Florida… Nothing. Absolutely nothing. So, with me in my flip-flops, the grill heating up, it’s sunny warm out …not really, it’s actually windy/rainy because of tropical stuff going on right now, but let’s play along… Let us walk through this EPIC recipe for the best steak tacos imaginable, shall we? This Epic Steak Tacos Caribe recipe is inspired by home and family, because having weathered Hurricane Irma, we are even more grateful for our home and all the nature right in our backyard (even though the birds haven’t all come back yet and everything is still pretty flooded and it has been really really windy and raining all the time). In Florida, we get to enjoy it (and grill) all year. But then also, given the damage in the Caribbean, I was just wanting to do a recipe with Caribbean flair because they are in our hearts and prayers. So, I have paired up with a new-to-me member of my favorite family of hot sauces, El Yucateco®. El Yucateco®’s ingredients come from Field to Bottle. It includes no artificial colors, but the same great taste that makes it the King of Flavor since 1968. 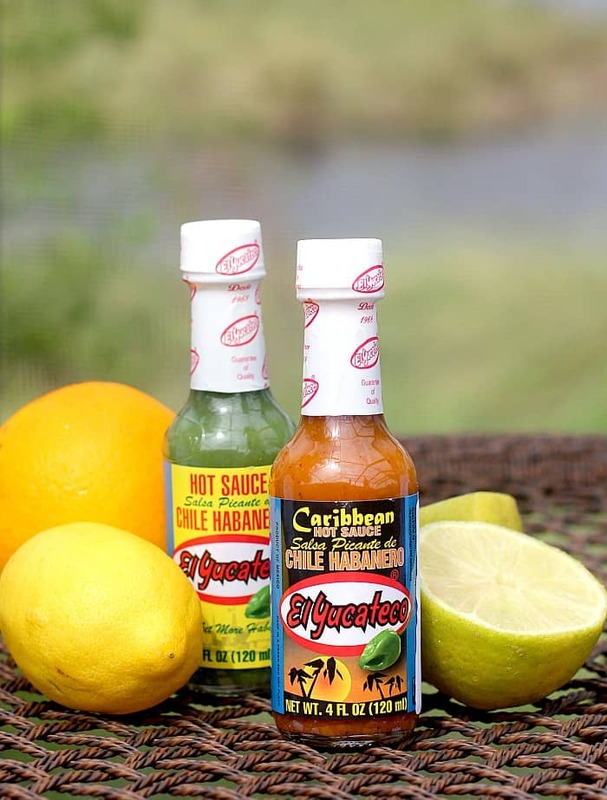 I have loved on the El Yucateco® Green Habanero sauce before in my Coffee-Crusted Rib-eye with Avocado Relish for Father’s Day and Grilled Veggie Hoagie for munching on the beach, but this time I grabbed the El Yucateco® Caribbean Sauce at Publix for this recipe that is all about Caribbean flair and uber-incredible flavor. Tangy, sweet. So savory. So flavorful. In your face, with no shame. And then topped with a queso-beer sauce, Lord help me. The El Yucateco® Caribbean Sauce enhances all these flavors, and I cannot even get over how it all comes together so perfectly for each bite. Why do I love these sauces especially? …because even as I type, low-key there is a bottle in my bag to go camping with me this weekend. They have that depth of flavor you don’t otherwise get. I keep the El Yucateco® Green Habanero sauce on the breakfast table for my eggs. I use the El Yucateco® Red Habanero sauce in my weekend “bloodies” …and I do make the best Bloody Mary’s oh yes I do. And now I have the El Yucateco® Caribbean sauce to kick up recipes like these EPIC steak tacos. They are not just hot sauces, they are flavors that I love. Moving on, yes there are a few steps to make this all happen, but that’s OK! Don’t panic, we can totally deal. First, we make our marinade, which looks like there are a thousand ingredients and maybe there are – but each serves an important purpose and at the end of the day you will thank me. So, we just make that happen, and move on. After the steak has gotten awesome in the marinade, we make the other components. First, an easy Pineapple Salsa that we just throw together and call it good. This will give the cool and sweet to our EPIC tacos. 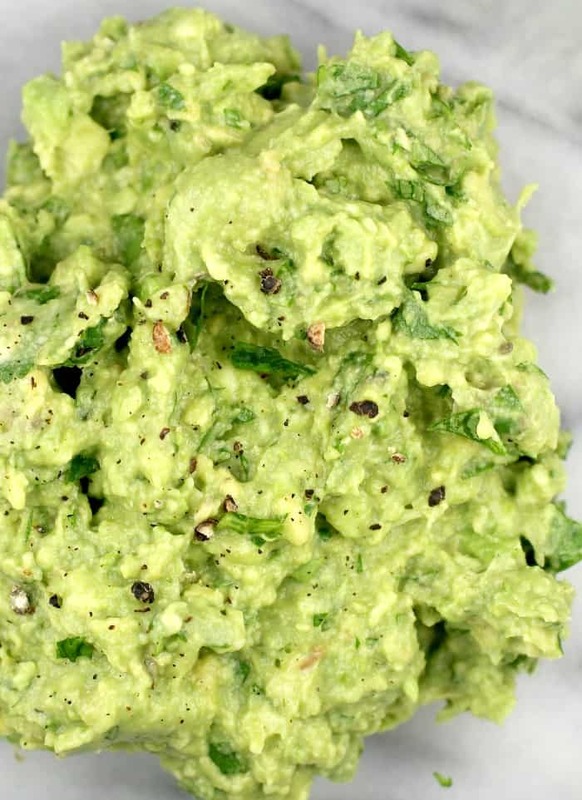 Then we make our guacamole, which is also quick and easy, and this will do that smoooooth cool guac thing that we all love. Then we prep our tortillas …now, you can skip this, but if you do and you use corn tortillas, they will fall apart when you eat. No bueno. So just a little cooking spray and a quick toast in a skillet or on the grill solves this issue. Or if you want, you can skip this all together and just use flour tortillas. My family prefers flour tortillas anyway, so you can just make that call. 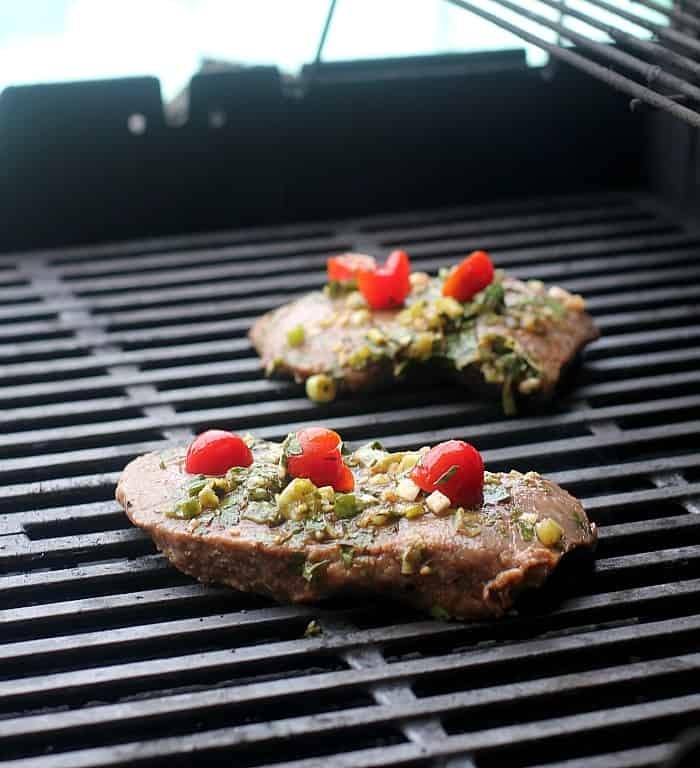 Next, we grill our steak. Adjust the cook time according to the thickness of your steak, but this should be over a screaming hot grill and only 2-3 minutes per side. Then, while the steak rests, we make our queso, and we are ready to rock and roll with our Epic Steak Tacos Caribe. The crisp lettuce, sweet pineapple, creamy guacamole, and ridiculously flavorful steak – THEN the cheesy queso. It’s hard to even describe how good this is – I’m kinda at a loss to be honest. And that’s rare for me. But this is one of those recipe ideas where I get it, and do it, and BAM I am so proud of it. Creative, delicious, you will win all the points making this for your family. So, that’s it kids! 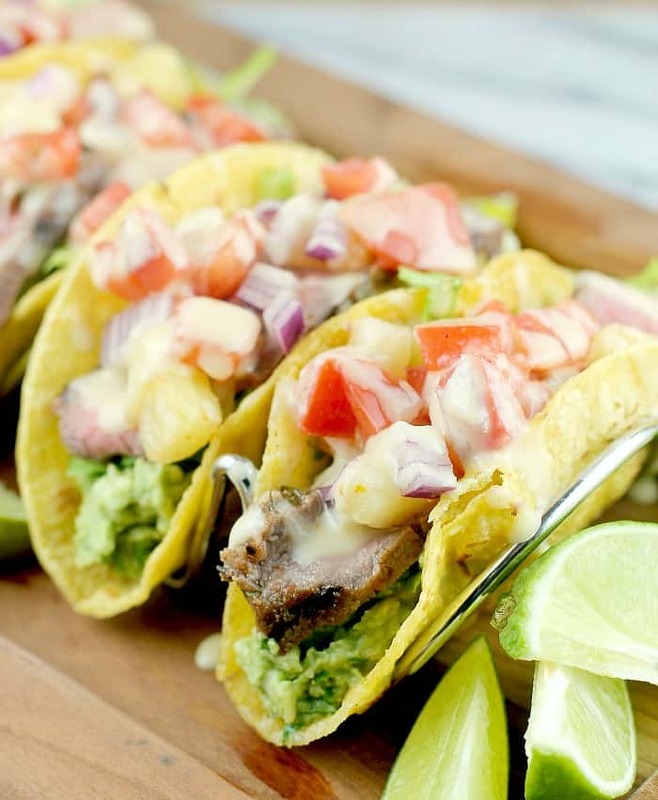 Epic Steak Tacos Caribe with Pineapple Salsa, Guacamole, and Caribbean Queso Fundido. What more can I say, this is a fantastic recipe, so much fun to make, and ridiculously good to eat. Enjoy! Steak soaked in a Caribbean-inspired marinade with SO much flavor, then grilled and served up in tacos with Pineapple Salsa, Guacamole, and finally, Caribbean Queso Fundido. In a bowl, combine the ingredients for the marinade. Add the steaks, cover, and refrigerate overnight. 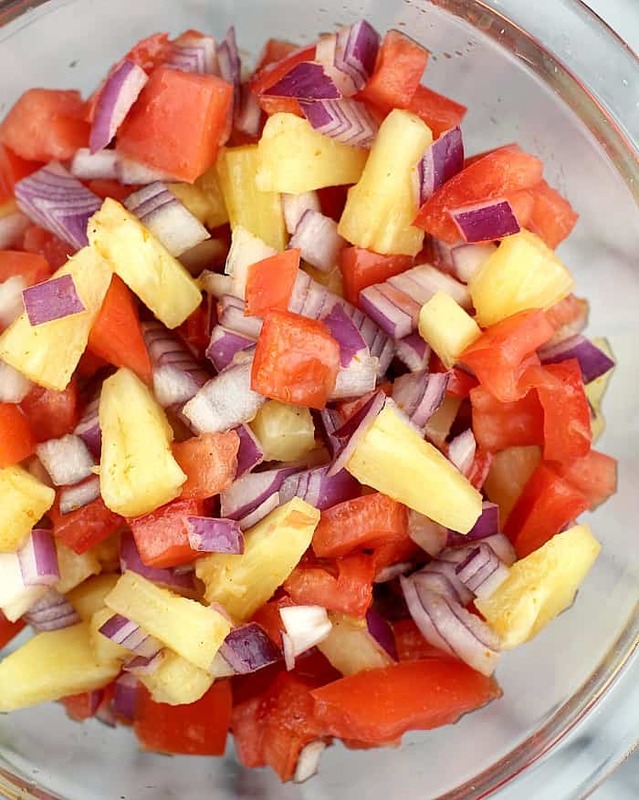 In a small bowl, combine the ingredients for the Pineapple Salsa. In a separate bowl, mash together the ingredients for the Guacamole. Heat a small, nonstick skillet over high heat. Spray corn tortillas with cooking spray and toast both sides in the skillet. Set aside. Heat the grill to screaming high heat. Grill the steaks, 2 to 3 minutes per side depending on thickness, to medium rare. Remove from the grill and set to rest 5 minutes. While steaks are resting, prepare the Caribbean Queso Fundido: heat the butter and flour in a medium saucepan over medium-high heat, whisking until smooth. Allow to cook 1 minute to make a roux. Add the beer and heat to a simmer. Whisk in the cheese and El Yucateco® Caribbean Habanero sauce until smooth. Remove from the heat. Slice the steak in THIN slices against the grain. 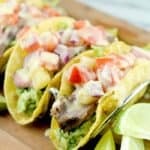 To assemble the tacos, layer in each corn tortilla: Guacamole, shredded Romaine lettuce, steak, Pineapple Salsa, and Caribbean Queso Fundido. Yields: 4 servings. I have used NY strip, rib-eye, and Top Sirloin steaks to make this recipe, and all worked well. 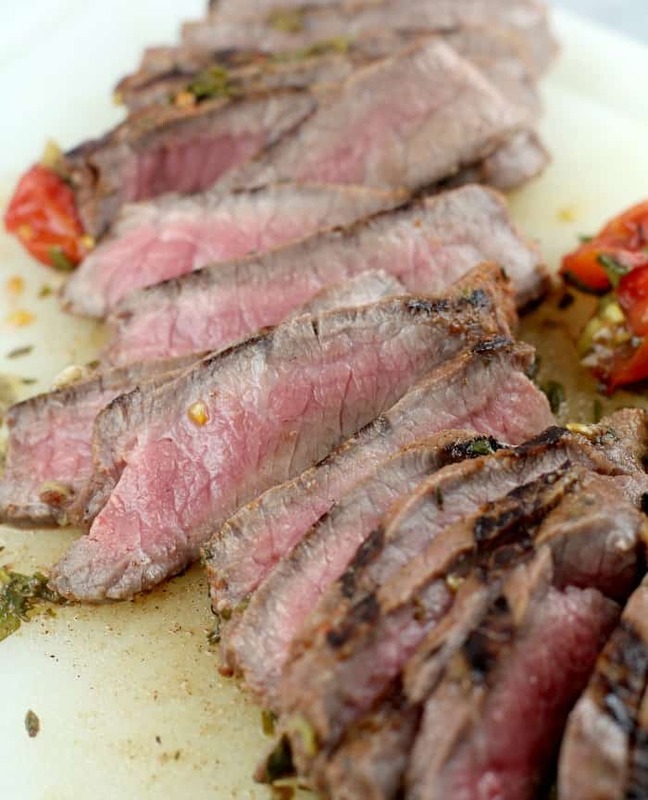 Flank steak would be another great option. Whichever cut of steak you choose, just remember to slice against the grain and THIN because when eating a taco, you don't want to be battling chewy steak. This marinade is phenomenal. As in spectacular. So good, that any steak, marinated, grilled, and served with a side of fresh guacamole or whatever, alone would be epic. For the beer, I usually go to a stout for cheese sauces like this, but for this recipe that would have overpowered everything else going on here. Instead, I used a hefeweizen and it was perfect with great flavor but not too much like a stout would have been. So, I recommend a medium-bodied beer for this recipe like a hefeweizen or IPA. For more El Yucateco® inspiration, visit HERE. And leave me a comment! Have you tried these hot sauces yet? That looks so colorful. I will just tweak the recipe to make it vegetarian and I will definitely try it out. These look amazing, I love fresh and vibrant foods, so appealing! I don’t think we have that sauce here in the UK but I’d search for it, it looks like something I’d like to use! STEAK! I have been having such a craving for some random bits of steak for a few weeks. At the end of the day i kind of forget but it never fails that i think about it in the mornings, and here we are, its the morning and i get to look at steak. This Steak tacos looks so delicious and tasty. I can’t wait to try this on but I will make a twist with some veggies on it. I just want the steak! I can’t have the other stuff, but boy can I have steak. My husband would love this for sure. I don’t eat meat but the gauc and sauces sound amazing. I love making homemade tacos so I’m going to have to try this recipe. So glad you made it through Irma safely! We go through a lot of hot sauce around here, and chile habanero sounds yummy. I’d love to try it in my lentil soup! My youngest will only eat steak. So, I am always looking for ways to incorporate it into meals. These look awesome. See now I just reallyw ant tacos. These sound sooooo good! I love red meat in my tacos. Your steak taco recipe sounds absolutely delicious! The tropical flavors really let you hold onto summer a little longer! These sound really nice. I’d love to do some sort of themed dinner with some special drinks to go along with these tacos. Um, can you move in with me and make these all the time. Can I make this with chicken or fish. I assume so but I wanted to make sure. thanks so much! I love taco and your steak tacos look divine! Thanks for sharing the recipe with us! This looks amazing. I really want that marinade – and ALL of the tacos! This looks delicious! Thanks for sharing the recipe and giveaway. Oh my goodness yum! I will have to try this recipe soon. We love tacos in our home. There’s nothing like a great taco. I think I will go to the grocery store tomorrow to purchase items for tacos tomorrow. Looks so yummy! Yummy, I will have to use this recipe the next time I have tacos. These tacos look insanely delicious! John loves a good hot sauce and I’ll be grabbing these. My son lives in Florida and we are so relived that the devastation wasn’t worse! These looks so amazing. That guac though! I think taco tuesday is sounding pretty good!